Thursday’s findings relied on data from Global Fishing Watch, a collaboration encompassing Oceana, SkyTruth, and Google. Researchers compiled billions of data points from tracking systems that the International Maritime Organization requires for roughly 70,000 fishing vessels. The result was a picture of fishing that the study, led by David Kroodsma of Global Fishing Watch, claims “has never been directly quantified.” Due to data limitations, the percentage of the oceans fished could actually be as high as 73 percent, the study said. There was particularly intense fishing off the southeastern coast of South America, the eastern coast of China, western Africa, and all around Europe and the Mediterranean, the research found. The North Atlantic, far northeastern Pacific, Indian Ocean and Southern Ocean were far more devoid of fishing. While Thursday’s study itself doesn’t delve into what areas are being overfished around the world, Savitz said experts have long documented overfishing in many places. But she said the latest data helps to illustrate that “the tragedy of the commons is very much at place in the oceans,” and that it underscores the for a more thoughtful global approach to regulating fisheries. The technology used by Global Fishing Watch to conduct the study relies on public broadcast data from the Automatic Identification System (AIS), which uses satellite and land-based receivers to track the movement of ships over time. Not all fishing vessels willingly broadcast their location, of course – particularly those intent on breaking the law – and vessels can switch off their trackers, potentially hindering the usefulness of the technology. But the United States and other countries already require vessels of a certain size to use the locator system, partly as a safety measure to avoid collisions at sea. Global Fishing Watch allows users to access that information to track specific vessels over time. 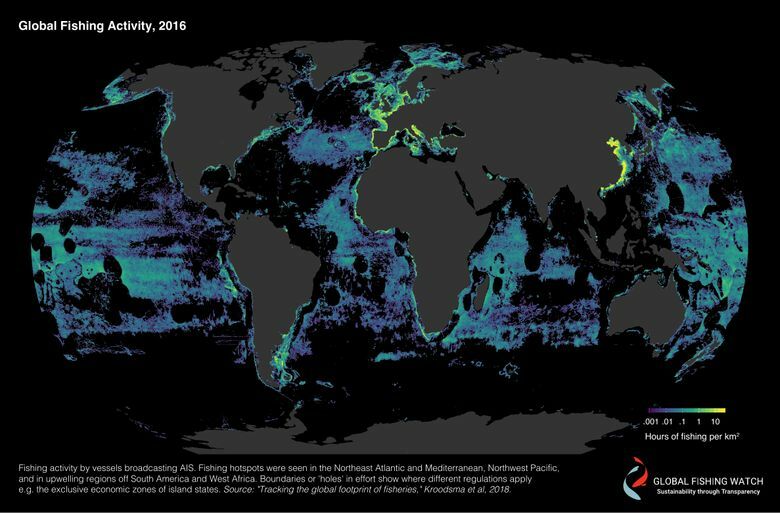 The new satellite technologies are one part of a broader, ongoing international push to reduce overfishing in the oceans and cut back on illegal fishing. One 2014 study found that between 20 and 32 percent of fish imported to the United States were caught illegally. Despite the huge scale of the effort, the fishing captured in the study represented only 1.2 percent of all the calories produced for humans to eat, the study found. However, as the Food and Agriculture Organization notes, these are particularly beneficial calories, because fish provide amino acids, fats, vitamins and other key nutrients and help prevent cardiovascular illnesses. This story originally published at washingtonpost.com. Read it here.